Development of a Sierra Nevada Corp. spacecraft reached another milestone when the company completed a key performance check under the Commercial Resupply Services Contract 2 with NASA. SNC said Thursday the Dream Chaser team demonstrated its ability to perform ground and flight operations to pass the agency's Integrated Review Milestone 5. The latest assessment indicates that the company remains on schedule to launch its first CRS-2 mission to the International Space Station in spring 2021. "It shows we can operate the Dream Chaser from the ground, including getting critical science in and out of the vehicle,” said John Curry, a program director at SNC’s space systems business. The multimission space utility vehicle underwent milestone tests at a company facility in Colorado and the Kennedy Space Center in Florida. 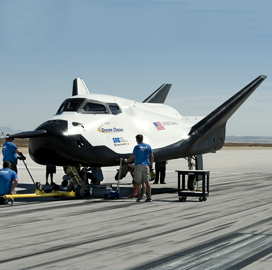 NASA's Armstrong Flight Research Center provided data from the 2017 free-flight test of Dream Chaser.